I haven't tasked this gun yet, but I'm almost there after a couple weeks of grinding. It's a pretty decent burst gun, for players who dont have armor, 2-3 shots if they are at full health. I have found that high level players that do have armor, just let loose a bit until they are dead. If you are on a map like parkside and have a feel as to how much it will take to kill them, you can give a 3-5 shot burst and call it good. 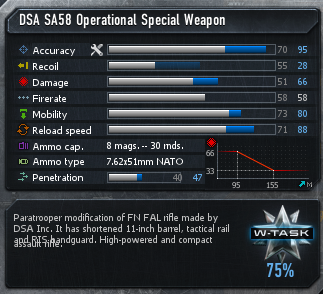 Don't let the 20s-30s recoil fool you, its still a tad bouncy and the flash it gives makes it mainly a burst gun. For me, since it is at 95 accuracy, i do a 3-5 shot burst on 60 meter+ targets, move a little to see if they're dead, and give another burst. If you try and let out 10 shots, they'll adjust to your burst and eventually kill you, so move around a little after bursts until they're dead. If you are standstill shooting the gun and have firestab, you will have to wait 5-7 shots before it actually kicks in. The penetration on the gun is what makes it a tad OP, so as I mentioned to Kine, CW pulled a soup nazi "no silencer for you". I'll post my thoughts once i task it, but it is a great buy imo. 52 pen on mine. 2 shot kills on armour within optimal range. 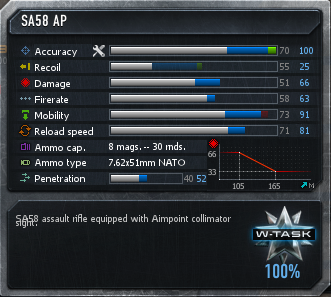 Haven't shot it yet but stats are similar to AKMS Gold. Double taps might be better. CQB go full auto obv. Amazing HC gun for OSM. Collimator is the exact same as the AS Val. 3's. Great mobility and reload speed, and absolutely shreds through armor. So not my gun untasked, but the potential makes me wanna task it. rate is 1 storm every 2 matches. NoBoty wrote: So not my gun untasked, but the potential makes me wanna task it. rate is 1 storm every 2 matches. That's a good average. About what I'd expect for an untasked gun. It's what I'd consider acceptable if I was to do it again right now instead of when terminal2 first came out. No one knew the map then so i could expect 1-2 per match. Completely unrealistic expectations when the player base knows a map, however.